Been awhile since I've seen a Bluebird at the park. This was one of two that were chittering in the tree as I approached. I got the picture then they took off. Temp started at 43, ended at 70. Overcast at first but cleared to sunny with high clouds. Light then steady breeze. Due to park closure for hunting and Thanksgiving events, I hadn't been to the park for some time. Today there were quite a few people out hiking, biking and jogging on the trails, perhaps trying to exercise away that second, or third, piece of pie they had a few days ago. Trails were for the most part, dry and easy to traverse. One notable exception was the northern end of West Potts Creek trail. Since Potts Creek has water in it and the trail crosses the creek bed, the trail itself has a section that is very muddy. Adding to the mud, today's weather was warm so the mosquitoes were out - I have a dozen bites already swelling up. The other exception was on Roller Coaster trail. There are significant portions of the southern section of the trail with standing water and mud - VERY surprising since we've had no rain yet the water trickles down from the hill above. No idea where the source is but this is West Texas and all water is welcome. I saw a Kestrel and a couple of Eastern Bluebirds which is unusual; especially seeing the Bluebird. 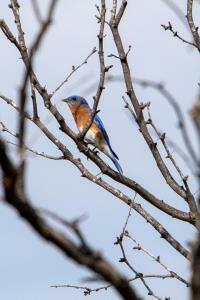 The last Bluebird I saw was at the North Shore portion of the park; to the best of my recollection, this is the first time I've seen this bird in the South Shore section (photo attached). There were some butterflies still fluttering around and quite a few low flying/ground hugging birds that would pop up, fly about five or six feet, then disappear in the scrub. A temperature drop is expected tonight that will last for three days then a gradual warm up before turning cold once again. I hope all the park residents have a place to stay lined up for this changing weather. IMPORTANT - The park trails map has been updated but the maps in the info kiosk have not. Trust the park map EXCEPT in regard to Armadillo Trail; the new park map does NOT include it. You will see trail markers (poles) with "Armadillo" painted on them at the junctions of Armadillo and East Potts Creek and at Armadillo and West Potts Creek.